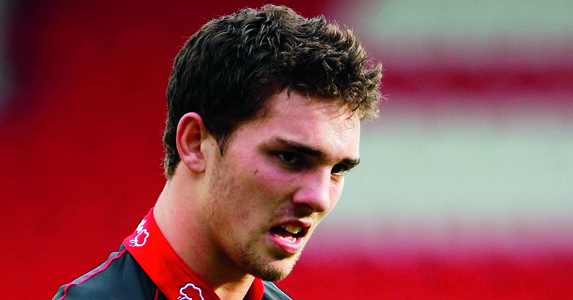 Teenage Scarlets winger George North has relived the moment he discovered he had been selected to win his first senior Wales cap against the World Champions, South Africa, at the Millennium Stadium on Saturday. He attended a squad debrief where coaches were discussing the performance against Australia last Saturday when head coach Warren Gatland stepped forward to announce the team to face the Springboks. North said: “Warren got up and announced the squad for the South Africa game and when he got to number 14 he suddenly read out my name. The teenager, who as 18 on April 13, has earned his Welsh squad call up after a string of impressive performances on the wing for the Scarlets this season. Speaking at the squad headquarters in the WRU National Centre of Excellence in the Vale of Glamorgan he said: ”It feels great and I really am over the moon. Now I am just looking forward to the game. “A couple of months ago I was starting the season with the Scarlets and now I am here. I’ve had texts coming through from the whole family. It’s amazing. The young winger said the opponents on Saturday will prove to be formidable opposition because they are always capable of raising their game. He explained: “Some people say they have come here off a bad Tri Nations competition but they are the sort of team that can turn it on when they need to. “There will be a lot of pressure on Saturday because we haven’t beaten them for the last eleven games but we’ve come through a great week of training. There’s a great vibe in the camp and hopefully we can come away with a win. “I will be nervous but to be honest, I can’t wait to give it my all and play my game in front of the Millennium stadium fans. North has already won Welsh Schools international honours at U16 level and was a star of last season’s Wales U18 team. He played for Rhyl Youth before heading south to Llandovery College and the Scarlets. He made his Scarlets debut in a pre-season friendly against Gloucester and has bagged four tries in his seven matches so far. At 6ft 4ins tall and 104kg North is known for his powerful running and is already a crowd pleaser with the Scarlets. Head Coach Warren Gatland has revealed how North had been in contention for selection against Australia until suffering an ankle injury. Warren Gatland said: “I have watched him play a number of games for the Scarlets and he has got all the attributes to be a quality player. He’s big, he’s quick and this will be a great opportunity for him. Born in Norfolk to an English father and Welsh mother, George moved to Anglesey at the age of two and is a Welsh speaker.